There’s no need to plan anymore for an island getaway when you already own your little slice of beach paradise. Imagine sipping a tropical drink at your leisure and admiring seaside sun views anytime, knowing you don’t have to leave. In Thailand, it’s not as impossible a dream as you may think. Let’s be honest, at some point the majority of us have let our minds wander into a daydream where you’re the master of your own little tropical dominion. You while away days supine in your hammock, the warm salty breeze is always blowing, with gentle turquoise waves lapping at the shore, and the supply of perfectly ripe coconuts is endless. But we always have to snap out of it and find our way back to reality … or do we? Maybe that concept of a tropical living is a bit idealistic, but the possibility of owning an island property in Thailand is closer and within reach than you might realise. The reasons are simple, says John Dopere, Geneal Manager of Koh Samui eal estate developer Samujana. “It’s a beautiful island and we build amazing houses.” All joking aside (he’s right though), it’s unlikely that the reasons in favour of investing in island property have ever been so great. For those considering purchasing a vacation home or secondary residence, having reliable and convenient access will be the first consideration. After all, what good is your piece of paradise if you can’t get to it. Fortunately, Bangkok Airways opened Koh Samui Airport way back in 1989 and currently offers dozens of daily flights including direct flights to Bangkok, Phuket, Singapore, Hong Kong, and many more to come. Once you’ve landed at Koh Samui’s award-winning airport, many property development companies employ a villa manager who will be waiting to whisk you away. There is a small contingent of foreign buyers in Thailand that opt for the peace and tranquility that can be found living in more rural, undeveloped areas. Those coming from more developed countries or cities may struggle with insufficient infrastructure, difficulty in communication, and lack of familiar creature comforts. That’s why so many fall in love with Thailand’s holiday islands, they discover a healthy economy, warm and welcoming communities, modern and international amenities, and a place that is thoroughly enjoyable to spend time in. For those who visited Koh Samui back in the 1980’s, things have come a long way. Although a bit narrow in places, paved roads criss-cross the island enabling access to all of the popular beaches and little hideaways. Electricity is supplied via an underwater cable from a power station on the mainland. In case of a power cut, many villas or estates are equipped with backup geneators. 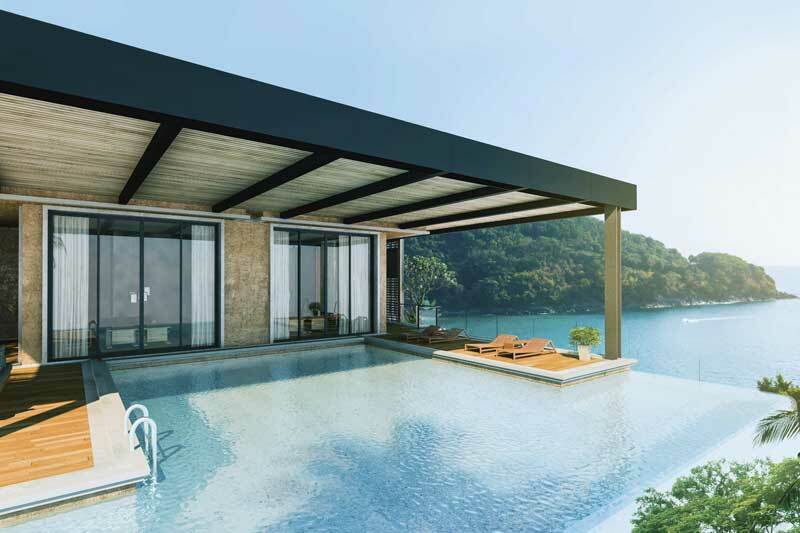 For even more peace of mind, Impact Samui’s latest developments, The Peak and Residence8, will be equipped with solar panels and battery storage as well as rain catchment systems for more independence and a smaller environmental footprint. Of course, if you look at who’s invested in island properties – a vast range of nationalities are represented. However, logic dictates that people living in places such as Hong Kong, Singapore, and Australia are better represented considering their geographical location and ease of access. Indeed, those residing in Asia, both nationals and expats, comprise the majority of foreign investment in island properties. Since the real estate market in Koh Samui and Phuket hasn’t experienced an overnight explosion, there hasn’t been the corresponding influx of investors looking to make a quick buck. Instead, properties have been purchased to serve as holiday escapes, rental properties, retirement homes, or as primary residences. Others buy with what Susan calls an “exit plan” in mind. They purchase a property and rent it out for several years before retiring, thus enabling them to make a smooth transition into post-career life when the time is right. Then of course there are those who fully commit and start a new life in Koh Samui or Phuket with their families. This is continually becoming a more viable option for some due to fast and reliable internet connections, quality and affordable healthcare and hospitals, international schools delivering a high standard of education, as well as security and low crime rates. “For those looking to own a property overseas but not necessarily use, the Koh Samui long-term rental market is buoyant due to the International schools, retirees [foreigners over 50 years old are eligible for retirement visas] and the foreigners who live here all year round,” explains Emma Johnson, managing director of Overseas Property Portfolio (OPP). If you’re worried about getting stuck without being able to rent your property, anything is possible but it’s unlikely considering the steady growth in tourism and development. A good indication of the health of the vacation rental market can be based in part on flight passenger numbers. In the last five years, foreign passenger arrivals via international flights to Koh Sami has doubled and Phuket has seen a 19% increase from last year. This steady increase is a promising sign for the ongoing economic health of the islands.